Have you ever wondered how to make money blogging? If you’ve been following my blog for a while, you’ve probably seen me recommend blogging as a way to make extra income (or even a full-time income). A few years ago, I knew nothing about blogging or even that you could make money through blogging. During the past year though, I have transitioned my hobby-blog into a profitable blog and am happy to share my experience. My income from blogging is consistently around $8,000 – $12,000 per month and I am continuing to learn new strategies to grow my blog and business. Before we jump into the different ways you can monetize your blog, there are a few things I want to cover first. Starting a blog and instantly making money almost never happens and I certainly don’t want to give you the impression that blogging is a “get rich quick” thing. While it’s possible to earn a full-time income from blogging, it does take time and a lot of work. This is obvious. You can use my step-by-step guide here to start your own blog, which also includes a FREE domain name for Mint Notion readers. I also recommend signing up for my FREE blogging course which I created for beginners who want to start a successful blog. Join today! In order to build a strong platform, you’ll need to create valuable content for your readers. Bringing value to your readers is the best way to make a profession out of blogging. Building trust your audience is essential if you want to monetize your blog. People don’t buy from people they like, they buy from people they trust. You can gain your audience’s trust by building authority through creating valuable content. You can then develop relationships with your audience by showing that you genuinely care. Having a professional looking blog can also help build trust. Having a blog, providing valuable content and building trust with your audience are all necessary if you want to take your blog to the next level. However, if you want to successfully make money blogging, you’ll need to develop a game plan and treat your blog as a business. If all you had to do to make money blogging was to write the occasional blog post, everyone would be doing it. Making money blogging is not this simple and it involves a lot of behind the scenes work. You’ll need to learn email marketing, branding, sales, social media, SEO and more. When I first started blogging, I had zero knowledge of these things and didn’t know anything about online marketing. I learned this stuff over time and I am still learning more every day! Many new bloggers start blogs about “How To Blog” because they see other successful bloggers in this niche. However, these new bloggers usually don’t have any prior blogging experience and just regurgitate what other successful bloggers have already said. This makes it very hard to stand out from the crowd since these new bloggers are not able to establish their own voice or draw from their expertise and experience when writing content. The reality is that many of these successful bloggers didn’t start out blogging about “How To Blog”. Everyone’s blogging timeline will look a little different when it comes to making money. Some bloggers start earning a few dollars in their first month of blogging, while other bloggers didn’t start making any money until six months (or more) into their blogging journey. I started my website as a hobby-blog in the beginning and didn’t focus on monetizing my blog until I was two years into my blogging journey. Now I earn a consistent income each month from blogging. Making money from your blog does take time. If you’re expecting to start a blog and instantly make thousands of dollars, you’re going to be disappointed. Now that we’ve covered the things you need to make money blogging and the common misconceptions about monetizing your blog, let’s talk about the different ways you can actually make money from blogging. This is the easiest way to start making money with your blog, but it’s also one of the toughest ways to make money. This is because display advertising doesn’t pay very much. Display advertising was the first monetization method I used for my blog, through Google Adsense, and it took almost 6 months before I made enough money to earn my first paycheck (meet the minimum payment threshold). Once your blog traffic starts to increase, you can work with other ad companies that will manage your display advertising for you, which can help boost your earnings. I currently work with AdThrive, and they have an amazing team who takes care of all my display advertising. If your blog receives over 100,000 monthly page views, you can sign up with AdThrive and earn (on average) $10 per 1,000 page views — that’s around $1,000 per month. Affiliate marketing is the process of being rewarded with a commission when you sell other people’s (or company’s) products. Affiliate marketing works best when you are completely honest about your promotions. If you recommend products just to earn a commission, your audience will see right through you. I share more tips about increasing your affiliate income here in this post. As a general rule, you should only recommend products that you have used and absolutely love, or products that you have heard great things about and believe your audience would love too. A good place to start is to join affiliate networks and apply to different companies or services that are relevant to your niche. Once you’re signed up, you can put a link or banner on your blog and earn a commission if someone clicks on the link and makes a purchase. If you’re interested in learning more about how to make money through affiliate marketing, I recommend taking Michelle’s course, Making Sense of Affiliate Marketing. She teaches you the exact strategies she used to go from making $0 in affiliate income to over $50,000 per month. I just recently finished taking her course and it has been a total game changer for me. After implementing her strategies, I have successfully been able to turn my blog into a full-time job. You can learn more about the course here. A sponsored post is where a company (or brand) will pay you to write a blog post that features their product or service. Unlike affiliate marketing, where payment is made when a reader takes an action (purchasing a product), a sponsored post is when a company (or brand) pays you a flat fee to write a post. You can find sponsored posts opportunities by contacting the company directly (and pitching your idea to them), or through media networks, such as Social Fabric. NOTE: Whenever you publish a sponsored post or use affiliate links, you must provide a disclosure within your post to let your readers know. This is the law. For example, you can put it at the beginning of your post and say “This post may contain affiliate links” or “This post was sponsored by Company XYZ”. Some of the most popular blog niches include personal finance, beauty and fashion, lifestyle, how to blog, food, health and fitness, and personal development. There are MANY sub-niches within each one, however I kept the list broad otherwise this would turn into a super long post. While you can certainly make good money from a different blog niche, the ones on this list have been proven to consistently make the most money. Why? These niches are so successful because it’s what people are searching for. Everyone wants to learn how to be the best version of themselves, so if you can show them how to better manage their money, you’ll get their attention. If you show them how to lose weight without dieting, they will listen. Display advertising: Most personal finance blogs do not make a substantial income from display ads. These types of blogs do not drive as much traffic as food blogs or lifestyle blogs. If your blog receives over 100,000 monthly page views, you can sign up with AdThrive and except to earn (on average) $10 per 1,000 page views. Sponsored Posts: Many personal finance blogs make a decent income from doing sponsored blog posts. These blogs usually work with companies that can help their audience achieve their own personal finances goals, such as saving or making money. Product Creation: These blogs often create their own products to sell. This may include digital products, such as spreadsheets, eBooks, eCourses, and so on. I have also seen personal finance blogs create physical products too, such as a Budget Planner workbook. Display Advertising: Fashion and beauty blogs don’t earn the majority of their income from display ads, unless they receive over a million page views per month. This is why I don’t recommend monetizing with display ads unless you run a food blog. Affiliate Marketing: Fashion and beauty blogs can make a good income from affiliate marketing. Common ways to promote affiliates on fashion and beauty blogs is to share product reviews and link to items they are wearing (such as makeup or clothing). This is often done through blog posts or on social media. Sponsored Posts: Many fashion and beauty blogs make the most money from doing sponsored posts (blog posts, social media posts, or videos). They work with fashion brands that will pay them to wear or represent their product. Sometimes these bloggers can even go on sponsored trips to promote a particular brand or event. Product Creation: Some of the most popular fashion and beauty bloggers have created their own physical products, such as makeup, jewelry, clothing, or accessories. Usually these products are created in partnership with a bigger brand. Display Advertising: Some lifestyle blogs can drive a huge amount of traffic. This is not the norm, however these high-traffic blogs can bring in good income through display ads. These lifestyle blogs usually get the majority of their traffic from Pinterest or Facebook. Affiliate Marketing: Lifestyle blogs can make a good income from affiliate marketing depending on what they are promoting to their audience. For example, a lifestyle blog for moms might earn income from promoting Amazon products, fashion products, health-related products, and so on. Sponsored Posts: Lifestyle blogs do great with sponsored posts. They can earn anywhere from $250 to $1,500+ per sponsored post. This includes blog posts, social media posts, and videos. Product Creation: If a lifestyle blog creates a product, it will relate to what their audience wants. For example, if your write about DIY projects, you can create an e-book, e-course, or printables to help your readers with DIY projects. Display Advertising: These blogs do not earn the majority of their income from display ads. In fact, many of these blogs don’t display any ads on their blog. Affiliate Marketing: Blogs that teach others “how to blog” make a decent amount of income from affiliates. They usually promote web hosting, website themes, paid plugins, tools for scheduling (such as Tailwind), and so on. Sponsored Posts: These blogs sometimes do sponsored posts, however they earn the most money from product creation or affiliate marketing. Product Creation: These blogs often make the most money from selling their own product. These products are usually eCourses or eBooks. Some of the most popular bloggers in the “how to blog” niche earn 7-figures per year from their digital products. Display Advertising: Food blogs usually receive the most traffic, which means they can make a 5-figure income per month from display advertising. Affiliate Marketing: These blogs usually promote kitchen utensils or special ingredients in their recipes. However, people who visit food blogs are usually not looking to buy anything and just want recipes. While they can earn money from affiliates, the majority of their income comes from display ads, sponsored posts, or selling their own product(s). Sponsored Posts: Many food blogs earn money from doing sponsored posts. Usually a brand will ask a food blogger to share a recipe that features their product. For example, sharing a smoothie recipe that uses a particular brand of protein powder. Product Creation: Many food bloggers eventually create and sell their own product. This can be a cookbook, meal planning guide, eCourse (for example Pinch Of Yum sells a course teaching others how to photograph food), and so on. Display Advertising: These blogs usually drive the most traffic at the beginning of the year when people set resolutions for the new year. Affiliate Marketing: Health & Fitness blogs can earn good money from affiliate marketing when they promote the right product. People are visiting these blogs because they are actively searching for a solution to problems. If you share a solution that your audience trusts, such as promoting a product on Amazon, this can be a great way to make money. Sponsored Posts: Usually a brand will ask a health and fitness blogger to share a blog post that features their product or service. For example, a fitness clothing brand might pay a blogger to share an exercise routine while wearing their clothing. Product Creation: Many health and fitness blogs have created their own product, such as an eBook or eCourse. For example, a yoga blog may choose to create and sell an eBook teaching others how to lose weight by doing yoga. Display Advertising: These blogs are similar to lifestyle blogs. Sometimes they can drive good traffic depending on their target audience, however many do not earn the majority of their income from display ads. Affiliate Marketing: They key to being successful in this niche is to focus on solving a specific problem. These blogs can make money by recommending products or services that can help their target audience. Sponsored Posts: These blogs can earn money from doing sponsored posts, however they earn the majority of their income from creating their own product or affiliate marketing. Product Creation: Many of these blogs eventually create their own product to help their target audience solve a specific problem. Usually this is an eBook, eCourse, live workshop, or even a mastermind retreat. You’ll need to start a blog if you haven’t already. 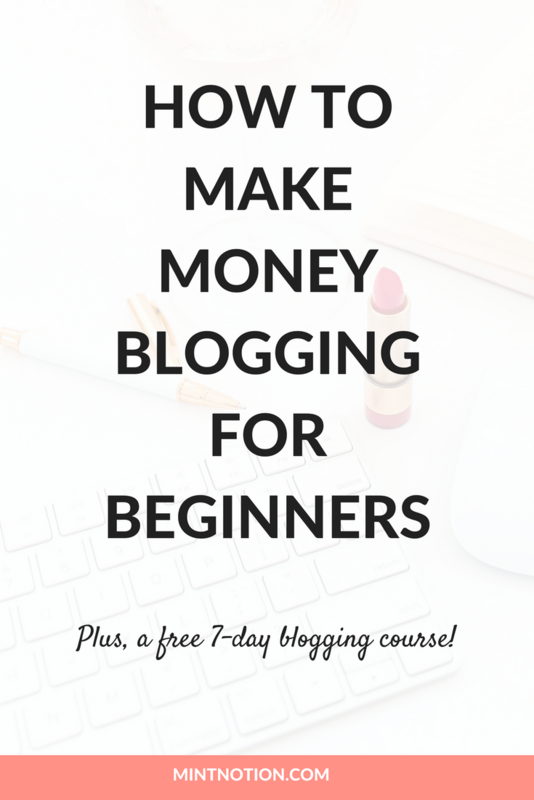 I recommend signing up for my super awesome blogging course here. In this FREE 5-day email course, I’ll teach you how to start a blog and make it successful. Create valuable content that your target audience will find insanely useful. Drive traffic to your blog and build engagement with your readers. Start monetizing your blog through one or more of the highlighted income streams. And don’t forget to enjoy the journey and have fun! You’ve got this! I hope this post gave you some insight on how you can make money with blogging. As you can see, there are a variety of ways to earn an income from blogging. Most bloggers who are making a full-time income from blogging are using a combination of these income streams. You can use any combination of income stream you wish, which is the great thing about blogging. The sky is the limit, so take your time and find the combination that works for you. Thanks for summing up all this useful and important information. The Trust issue is super important, especially for online interactions. Great post! Yes, brands are willing to sponsor lots of different content: videos, social media posts, blog posts, etc. There are lots of opportunities for monetization. Great tips! You are absolutely right! Thank you for useful tips and inspiration! Great advice, as always! I think the biggest takeaway is knowing that everyone’s blogging timeline is different. I’m still in the hobby phase of my blog 2 years in and I still love it as much as I did the day I started it!